It’s no secret that women have unique health needs compared to men. However, according to women’s health expert Marla Ahlgrimm, women face further challenges with age. One of these is the ability to live independently beyond the age of 75. Marla Ahlgrimm explains that women live longer than men and the need for end-of-life care is great. Seven out of 10 nursing home residents are women, the vast majority of these are no younger than 80. And nursing care is expensive and has the potential to cost more than $100,000 per year. The average nursing care stay is two years, although a person who reaches her 80th birthday may need custodial care much longer than that. Marla Ahlgrimm notes that the majority of seniors aged 85 and older are female. A woman’s ability to pay for long-term care is hindered by factors such as household income after her husband’s death, says Marla Ahlgrimm. Typically, men make more money than their wives. This is especially true when the couple has children and the woman choose to stay home and attend to domestic concerns as opposed to focusing on a career. Senior widows often have an income of less than $15,000 per year. African-American and Hispanic women are at an even higher risk of living at or below the poverty level. Marla Ahlgrimm explains there are different types of care for different situations. Many women will receive unpaid care provided by family members. This can go a long way toward helping a woman remain independent. For example, she may have an adult child visit her home daily to assist with cooking and cleaning. 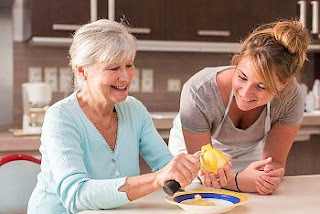 Dementia, injury, and other health concerns may, however, necessitate the need for custodial care in an assisted living or skilled nursing facility. Assisted living, says Marla Ahlgrimm, is a long-term situation where an overall healthy senior can receive assistance with everything from household chores to medication. Assisted-living campuses often provide ample fitness and recreation opportunities with the option to transition into skilled nursing care if need arises. Skilled nursing care – which is often referred to as a nursing home, is a clinical setting where seniors receive help with everything from bathing to walking.